After my post last week with the old wedding photos of my mom and my aunt, I was given a tip by a new follower to check out a site called Sepia Saturday (by the way, thank you ALL for your beautiful comments on that post). 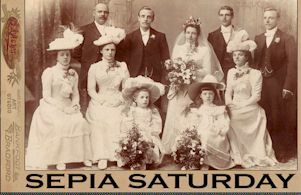 Sepia Saturday is a blog where people share historical photographs and stories of family history. It looks like fun so I thought I would play along this week. This photograph was taken in 1908. My aunt recently came across it and gave it to me because she knows I have been collecting old family pictures. It is hanging in my apartment in a nice frame, so this is actually a picture of the picture because I didn't have time to take it out of the frame to scan it. My grandfather on my mother's side was a fraternal twin. We don't know for sure which baby is my Pop-Pop, but I have decided that he is the one on the left when you are looking at the photo...it looks a little like him to me. The two people holding the babies are my great-grandparents. I never met any of my great-grandparents on my mother's side, but was fortunate to know both of my great-grandmothers on my father's side until I was about 12 or 13 years old. My aunt and I have been talking about trying to do a little research on our relatives in this branch of our family tree. Maybe we'll start that project soon. Have a great weekend all! I just went to that blog to check it out and now I want to visit my grandmother and see what pictures I can borrow and share. Great post, great pictures. Love it. The pictures were all very formal then. Perhaps this was the baptism of the babies. The mother looks fine in her skirt with a ruffle at the seam and a white blouse. They are a handsome couple. Wonderful photo and post. Ever notice how serious people look in the old photos? Heritage, background and where the photo was taken if you know? Photos raise so many questions, don't they; hope you have answers. How great to have known great grandparents! What a wonderful photograph. I enjoyed your photo from last week too. The babies looked clean, well nourished and cared for.The couple look almost european. His hair could be popular today while her's is severe and matronly.They seem to have a floral carpet on the floor. It's clear, seeing as its a photo of a photo. A very good, well preverved shot. Your great-grandparents would have been so proud to hold those beautiful twins. It's a super photograph. I wish you luck with your family history research. What a terrific picture! You must be so pleased to have it hanging in your home. Just a word of warning; if you sign up for Ancestry.com to do some research, you may find it eats up all of your time. It is so addictive, BUT great fun and SO rewarding! Good luck! Oh, and welcome to Sepia Saturday! What A Beautiful Photograph.thank you For Sharing. it Must Have Been Really Difficult Posing With 2 Healthy Babies to Manage & hold still! I second what Kat says (and by the way, to read about Kat and her new volume of poetry, I did a post on her at my other blog a couple of days ago at meriak.blogspot.com). I subscribe to Ancestry and genealogy is a black hole that will swallow up all your time. Great photograph -- so happy you're its proud owner now because you'll treasure it. I am so glad you are with this group. It sounds as if you are finding inspiration and an interest in preserving those photos and memories. That is a perfect picture for SS. Yes the poses were very serious looking years ago. Having a photo taken was not an everyday occurrence like now. Great job. What a fabulous photograph. It's so wonderful that you knew your great-grandparents. This must have been a special occasion with the boutonniere in his lapel, her beautiful blouse and skirt, and the babies in bonnets and beautiful dresses. Did you notice that both babies have little bracelets on their wrists? Very sweet. I'm impressed that you framed and hung the photo in your home, and that you were able to get such a good photograph of it. I'm with Pat -- I want to know a little more about the heritage of your great-grandparents. What a great photo. It looks so "old world". Have fun with your research. You can tell how much all of us enjoy it. I agree Ancestry.com is very addicting. Great photo. Makes one wish they could go back in time to visit relative never really known. I love this post of old photos. Thank you for the link to Sepia Saturday. This will be something fun to do.! nice that you knew some of your grand-parents. lovely picture. There is a wonderful symmetry in the pose as well - most fitting for a picture of twins. Thanks for sharing these memories on Sepia Saturday.